St Mary’s College Visits Her Story. It was HOT today but that didn’t stop 2 classes from St Mary’s College enjoying the experience of Her Story this morning at the Cascades Female Factory. The students were wonderful – so engaged and attentive. 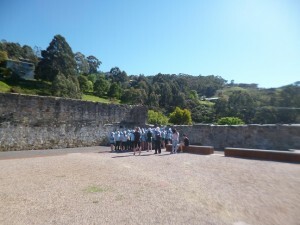 Her Story is such a wonderful way of presenting our convict women’s history to anyone but particularly to school students, some of whom may be temped to think that history is boring. Not the way Live History Plays does it!!! St Mary's Students in the Probation Yard.